Submitted by mahoney on Wed, 02/13/2008 - 8:42pm. Taco Bell across the United States and Canada...After experimenting with alternative food items, Glen Bell opened three Taco-Tia stands between 1954 and 1955, which he later sold to his partners. He then opened the first Taco Bell in Downey, California on March 21, 1962. The first Taco Bell franchise was sold in 1964 and the company became public in 1969. In 1978, the chain was sold to PepsiCo. The chain was spun off along with Pepsi's other fast food restaurant holdings as Tricon Global Restaurants in October 1997. Tricon became Yum! Brands in May 2002. 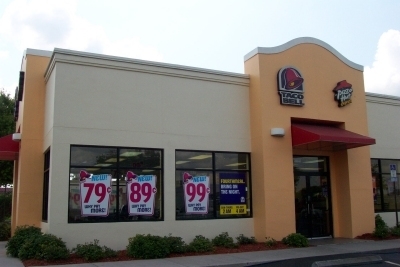 As of 2005, there are 5,845 Taco Bell restaurants in the United States, including 1,252 company-owned locations, 3,803 franchisees, and 790 licenses. Completed the verification of all of the locations to the official Taco Bell website locator. In addition, whenever other restaurants were determined to be in the same building, I have included that information in Column C. If I missed any locations, please send them to me. Added 12 new locations in TX. Corrected the coord for those locations in Florida that share a bldg with KFC. Completed updating the remaining states OK thru WY. Added 509, deleted 161 and corrected 50 addresses. Updated NS, NV, NY and OH. Added 115 locations, deleted 72 locations and corrected 13 addresses. Updated NB,NC,ND,NE,NH,NJ and NM. Added 125 locations, deleted 47 and corrected 16 addresses. Updated MI, added 46 locations,deleted 16 and corrected 7 addresses. MO, added 16, deleted 7 and corrected 3 addresses. Updated LA, added 34, deleted 6 and corrected 1 address. MA, added 14 deleted 8 and corrected 2 addressea. Updated IN. Added 36, deleted 6 and corrected 3 addresses. Updated IL. Added 40, deleted 15 and corrected 6 addresses. Updated IA and ID. Net increase of 14 locations. Added the HI locations to the file. Updated FL. Net increase of 67 locations. Completed the update of CT,DE and DC. Updated CO. Added 23 locations and deleted 15 locations. Completed the update of BC. Decrease of 2 locations. Updated AZ. Added 25, deleted 7 and corrected 6 addresses. Updated AR. Net increase of 7 locations. Updated AL. Added 13, deleted 9 and corrected address. Submitted a location in Mt Orab,OH. Corrected the addresses for the locations in Carmel,IN and Westfield,IN. Added new locations in Tecumseh,KS and Topeka,KS. Added new locations in Cresco,PA and Columbia,NJ. Submitted a new location in East Stroudsburg,PA. Location in Bristol,TN has reopened and also added 4 new locations in Orlando,FL. The location at 1111 Volunteer Pkwy,Bristol,TN is closed for renovation. Added 4 new locations in OK and 1 in NM. Added a location in Shamrock,TX. Corrected the coordinates for the locations in Houghton,Mi and Hinckey,Mn. Corrected the coordinates for the location in Peru,In. Corrected the location in Fernley,NV. Added 6 new locaitons. Yuma,AZ, Las Vegss,NV (2), Henderson,NV, Charmco,WV and Lewisburg,WV. Submitted corrected coordinates for the location in Martinsburg,WV. Added new locations in Kodiak,AK, Fayetteville,AL, Geneva,AL and Orlando,FL. Submitted a new location at 3240 Barrett Lakes Blvd NW, Kennesaw,GA, (678) 797-9946. Corrected the coordinates for the location in Jacksonville,IL. Corrected the coordinates for the location at 6425 Source Center Point, Colorado Springs,CO 80923, and removed on duplicate. Added a new location in Franklin,VA. Updated the file. Net increase of 438 locations. Corrected the coordinates for the location in Lincoln,AL. Added 4 new locations in CT. Noted that file had 2 dupes, one in Fl and the other in Tx. Submitted single quotes instead of double quotes on lines 1684, 1691 and 5167. Added over 500 locations to the file. Deleted Delaware House Service Area location. Added in error. Reformatted the file and removed over 500 duplicates. Corrected coordinates on various locations. Added 1 Charlotte, NC location. Added 6 NH and 1 MA locations. Added 83 new locations in Oregon. Deleted Richmond Missouri location due to closing. Added 1 St, Thomasville, NC location and deleted 1 Madison Heights VA location due to closing. Corrected coordinates on Guelph, Ontario location. Added 30 new locations in and around Redding, CA. Added 163 New locations in and around the Detroit, MI area. Corrected coordinates on 820 Gardens Blvd Charlottesville VA location and added 1 new Ruckersville, VA.
Found and deleted more duplicate entries. Fixed issue were many entries did not have negative sign longitude. Added missing locations including many Midwest entries. Corrected coordinates on 102 Moraine Pointe Plz-Butler-PA location. Removed all duplicate file entries. There are currently 3 users and 155 guests online.